I have a new favorite author. So far, he only writes short stories, but that’s fine with me, as he has already established himself as a favorite visual artist of mine. The kid is multi-talented. Here is one of his latest literary offerings. In honor of discovering this new talent, I will now hold an impromptu book club meeting regarding this work. Let’s dig deeper into the text. There’s a surprising amount of mystery surrounding this episode. For example, why is it set in Berlin? Well, actually, that’s not so much a mystery if you have followed this artist and seen the pickelhaube and Prussian flag requests in his Christmas letters to Santa, like I have. Berlin is the capital of Germany. That says it all. Were they playing American football or European football (soccer)? We can’t be sure, but the fact that uncle Bob threw the ball indicates that, unless he was goalie or was throwing the ball in from out of bounds, it was likely American football. Also, the fact that he threw it at D-fence, or in German, Die-Fence, indicates he probably owned a cardboard cutout of a picket border which he took to NFL games. Also, all the footballs being gone from the store lends evidence to it being an American football, as the German sporting goods shops would less likely be out of soccer balls. Who misplaced the pump and patch? This is the question a father asks every time something goes flat. No one ever takes responsibility, and no one ever will. Did Jake have another ball at his house, or did they make the best of things and play catch with the flat ball? I like to think Jake demonstrated admirable character development by showing his eight comrades that inflation is just a state of mind. The world thinks you can’t play catch with a popped ball. You can submit to that kind of limited thinking, or you can change the world. Way to go, Jake! You are a true football hero. Sometimes the answer to great problems (global strife, world hunger, playing sports with an uninflated ball) are all about shifting the perceptions of the major players. This is an uplifting story of human triumph. It shows that you can do anything your mind allows you, like playing with a popped ball, or even hyphenating and splitting single-syllable words onto multiple lines. I think I’m going to be a fan of this guy for a long time. This entry was posted in Random Toy Box and tagged children, Education, Elementary school, family, fatherhood, humor, parenting, reading, short story, writing. Not sure about American style footballs, but Berlin use to be known for it’s fence. You think they tore it down because it popped too many balls? Good story… it occurred to me also though, that a fence with spikes on it sharp enough to cut through the thick leather covering of a football may not be the safest thing to have surrounding one’s yard. Unless maybe its a prison yard. This is Germany, remember. They used to pop balls with the spikes on their heads. Fantastic story telling! With sound effects, the ball went POP! I love they were “in” bad luck. Yes, we have a future blogger on hand. Can’t wait to follow! Hopefully he’ll learn how use his talents to make actual money. A familiar story: the child succeeds where the father failed. Just one of the many lessons hidden in the text. Perhaps one of the greatest authors of our time. An the way he weaves a tale of suspense is enthralling. A master story teller. I can’t wait for the audio version to come out. An audio version is a good idea; that will give him some more practice reading aloud. In the fast-paced world of psychological thrillers, luck can change on a dime. Just like the proud pappy you are! 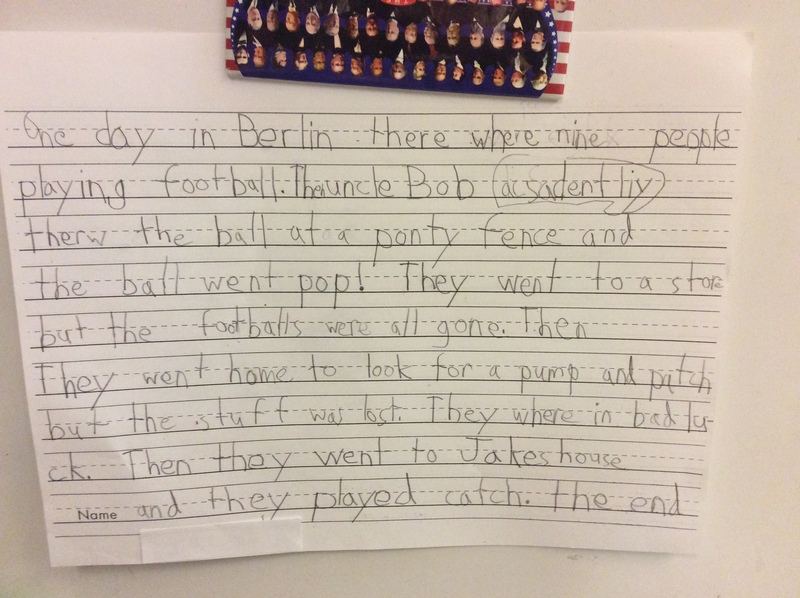 Another budding writer! Hopefully, he’ll be more successful at it. Count me in, I’m a fan as well. In fact, he reminds me quite a bit of another new writer I’ve been reading quite a bit lately. He just started a blog of his own. I hope he makes something of himself. If they make something of themselves then the parents can say, “See? I did one thing right after all.” Even if the parents are only talking to themselves.